There are two ends of the Rubicon trail in Northern California. Most people start on the Loon Lake end and make their way toward South Lake Tahoe on the Eastern end. 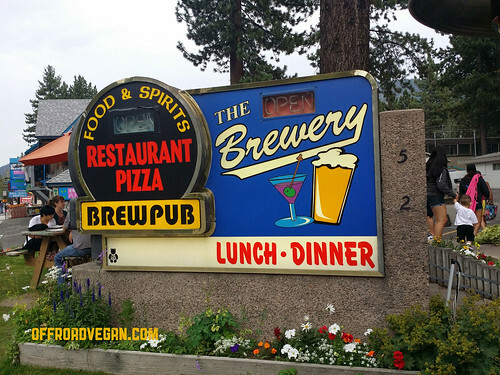 While the West end at Loon doesn’t have any amenities, the Lake Tahoe region has a ton of great, hidden vegan gems – some to hit up, and some to avoid. I will update this little guide as my time in Tahoe expands and I am able to check out more and more places. The perfect spot for a post-wheeling pint. While roaming our local New Seasons today, something caught me eye in the rainbow of colors in the Gardein freezer section. It seriously is starting to look like Rainbow Brite puked Skittles all over the place. Anyway, the pink highlight color on the bag drew my eye and I snagged the last bag in the freezer. The bag promises it contains a packet of awesome sauce. So with that, we planned on making it part of tonight’s dinner. Pardon the messy stove but these splattered a little! As with all of Gardein’s fake meats, these were simple to make. 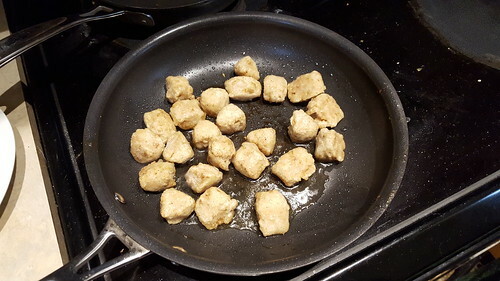 Simply toss the frozen bites into a skillet with some oil and cook thoroughly. Toss in the awesome sauce, and serve over a bed of whatever starchy goodness you want. We went with some sticky rice.